The Episcopal Church embraces a via media, or middle way, between Roman Catholicism and Protestantism. Rooted in the ancient heritage of the early church, and formed by the reformation in England, the Episcopal Church organized as an independent church from the Church of England shortly after the American Revolution. Episcopal means “bishop” in Greek. The Episcopal Church is governed in part by its bishops. 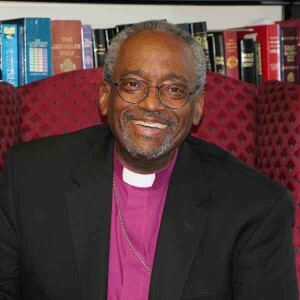 The Most Reverend Michael Bruce Curry was installed as the 27th Presiding Bishop and Primate of The Episcopal Church on November 1, 2015. He is the Chief Pastor and serves as President and Chief Executive Officer of the Domestic and Foreign Missionary Society and chair of the Executive Council of The Episcopal Church. As Presiding Bishop, he serves as chief pastor to the Episcopal Church’s 2.0 million members in 109 dioceses, three regional areas in 17 countries. He meets and consults with other principal bishops of the Anglican Communion, which is made up of 38 autonomous national and regional Churches plus six Extra Provincial Churches and dioceses, seeking to make common cause for global good and reconciliation. In the Episcopal Church we follow the Book of Common Prayer to guide our worship. It provides a basic structure for worship, while allowing for local variation of expression, particularly in music. It is called “common prayer,” as the entire body of the Anglican Communion prays the same prayers together. Common prayer unites our hearts and allows for bonds of grace while respecting differences of opinion in relation to the interpretation of scripture.